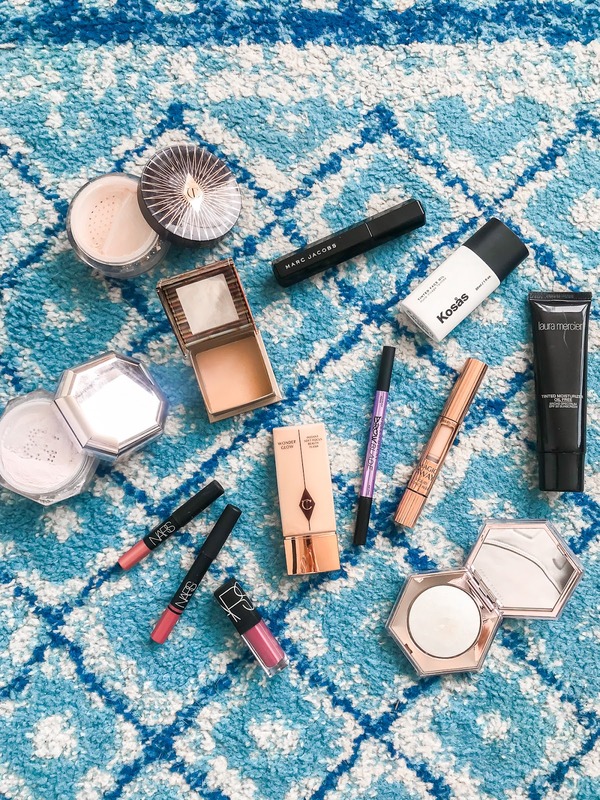 Finally getting around to posting about some new makeup favorites! My relationship with makeup is so weird because I LOVE to wear it and apply it but I don't actually use it often. Maybe that's why I like it so much? Regardless, I've been trying out some new products that I love (and some I just like) and I wanted to share them with you. I hope you guys like these kinds of posts. I love them and want to write more! Charlotte Tilbury Powder: I love my Laura Mercier powder (the regular and the brightening one) but I wanted to also try out the Charlotte Tilbury one as well. I've seen good reviews online and love her products. Her flawless finish powder is one of my all time favorites. This powder is good, but nothing to write home about. I'll try to incorporate it into my routine here and there but I don't really find myself reaching for it often. Marc Jacobs Mascara: I've talked about this mascara before but I wanted to officially have it in a blog post. They sent me this a while back and I was like, "Ehhh" because I LOVE my YSL: The Shock mascara and didn't think anything could change that. Until I tried this. It's really good. So good I've repurchased two more (one big and one travel). Kosas Oil Foundation: You can see a quick review of this foundation here and here on YouTube. It's SO cool! It's a literal liquid/oil that has color and does a really good job of giving you a nice natural look. I've been hunting for more natural foundations and that's what this is! It's also clean beauty approved which is an added bonus. Fenty Powder: As I mentioned, I wanted to try out some new powders and bought this in lavender. I liked the idea of having a different color (think banana powder for lighter skin) for brightening and this does not disappoint. It works SO well as a brightener. Sometimes if you leave it on and let it bake for too long it almost works too well. It's great and in my heavy rotation of items. Hoola Lite Bronzer: I have really light skin, especially after the winter. I'm pale and found that a lot of bronzers will look almost too red on my skin. Some are muddy, some are orange and some are red. It's so strange. In the summer, the original Hoola is a favorite of mine. But at this time of year it's just too dark. I tried out the lite version and I'm really liking it! It has a very cool undertone so there is no red that peeks through. Urban Decay Brow Pencil: To be honest, I care the least about my eyebrows. I know it's bad because "they frame the face" but I just never really cared about them or learned how to do them. I've always bought the Anastasia Beverly Hills Brow Wiz but I hateeeeee that the spooly end always breaks off. It's one of the most annoying things ever, so I stopped buying them. Since then, I've been looking for a replacement and heard great things about this brow pencil. On one side you have the regular pencil and on the other you have what looks like a felt tip. It allows you to draw lines and give your brows that microblade effect. Charlotte Tilbury Concealer: Again, I heard great things about the concealer. While it's great, it's not better than my Tarte Shape Tape concealer. I don't know that anything will ever compete. The closest was my Nars radiant creamy concealer. I've never really worn this concealer and thought, "Wow this looks so much better." It's good (not as full coverage as Tarte) if you're looking for something a little lighter under the eye. Laura Mercier Tinted Moisturizer: As with the Kosas above, I'm looking for a more natural lightweight foundation and have been testing out the oil free version of this tinted moisturizer. I'm really loving it so far. It's thick, so I use a brush (or my hands if need be) to put it on, but it's great. It looks very natural and gives a really beautiful finish. I also used it on Ashby in this video and she really liked it as well! Out of everything I'm talking about today, this is probably my favorite item! Nars Lipstick Duo: This was sent to me (you can see me testing out the colors in this video) and have been wearing it nonstop. It's quickly becoming my go-to lip color. I'm using the stick for a matte look and the gloss for a more dressed-up look. Charlotte Tilbury Wonder Glow: This isn't super new but it is new in the sense that I just got around to trying it. It came as part of a moisturizer set (I use this moisturizer for when I do my makeup) and decided to try it. I didn't officially try it out until Grace used it when she got her makeup done and it looked SO GOOD. Then I was like, "I gotta try it" lol. I did and it was great. Fenty Highlighter: I'm all aboard the Fenty beauty train. I've liked every product I've tried from them, and this highlighter is no exception. It's BLINDING. It gives a super wet look to your face (or wherever you use it). It's not something for every day, but when there is a time and place to use it, oh boy get ready. A Fenty highlight that I use more often is this little one I got in a duo set! Water Eye Mask: This isn't pictured and the jury is still out on how well it works, but it's an honorable mention. It's meant to be an overnight hydration mask for your eyes (can go below and above the eye). I also bought the face mask version, but have yet to try it. I cannot for the life of me find an under-eye cream that I like outside of the La Mer under eye concentrate. I've heard about that Kosas oil foundations before and it seems so intriguing! I don't know what your skin type is but do you think it'd work on my combination skin? I'm always scared products that are too hydrating can either break me out or make me look oily quickly. Kind of on the same page as you - I like make up, but I don't really do mine much. I LOVE Laura Mercier tinted moisturizer, a good brow fill in/gel, blush, and highlighter! That oil foundation seems so cool! It looked great in your videos. I wonder if this would be good for oily skin?